San Francisco is a beautiful city with a rich architectural and artistic history. I love the merge of modern urbanism and European charm. After touring the City with the Golden Gate Bridge it is evident why it is a filmmaker's paradise. On our first full day in San Francisco me and my best friend Kristy enjoyed touring the city in San Francisco Movie Tours style. Viewing clips of famous films driving by where it all (or where it appeared to have) took place was engaging enough to make 3.5 hours breeze by. 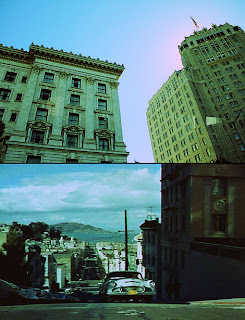 The famous movie landmarks and areas of San Francisco was a creative way to get oriented in the 7x7 mile city. The pace was fast and if you blinked there was the potential to miss a detail. Here are the most notable movie locations of the guided tour. 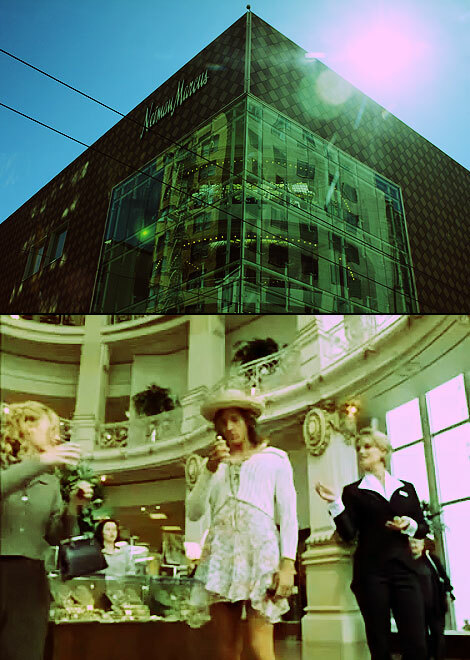 In order to be a movie city you have to have at least one spy movie. Of course this can only mean James Bond. 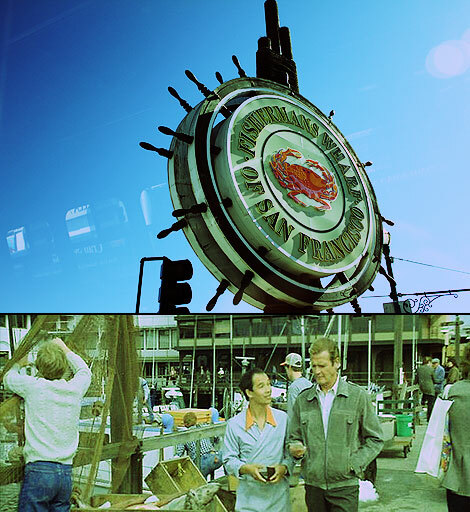 A View to a Kill (1985) starring Roger Moore had one of the scenes filmed on location at Fisherman's Wharf. I remember seeing The Bachelor (1999) with Chris O'Donnell in theaters. Yes it is a total chick flick. 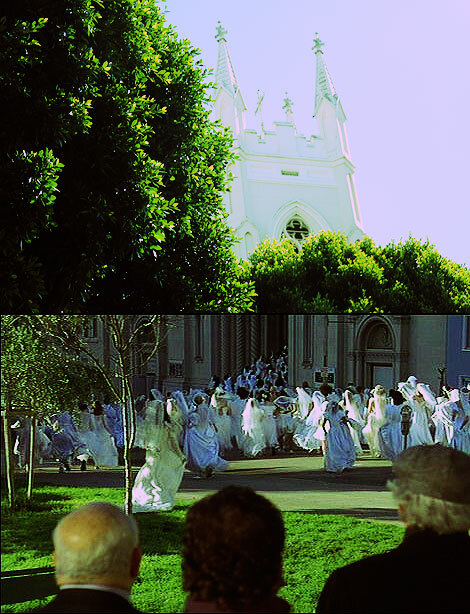 When casting for the bride mob extras there were not enough women who auditioned. Instead local San Franciscan men were scouted to dress up like women. 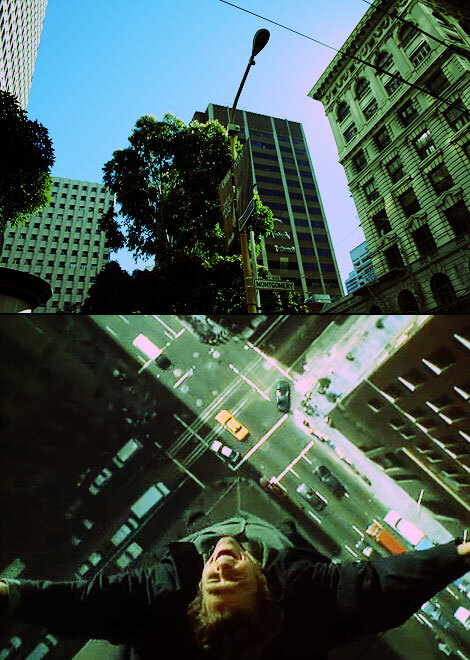 Perhaps one of the most powerful movie scenes taken place is from Fearless (1993) where Jeff Bridges' character stood atop of the rooftop at 400 Montgomery Street with the famous San Francisco financial buildings in the background his scream echoing. The Hitchcock classic film Vertigo (1958) features footage from many locations in San Francisco with its steep hills, views, and bridges. Gavin and Madeleine's apartment building is The Brocklebank Apartments at 1000 Mason Street across the street from the Fairmont Hotel. Hitchcock usually stayed at the Fairmont when he visited and where many of the cast and crew stayed during filming. In the Disney movie George of the Jungle (1997) Heiress Ursula Stanhope returns to San Francisco after being rescued by George in the African jungle. In attempt to urbanize George Ursula takes him on a shopping spree at the Neiman Marcus in San Francisco's Union Square. 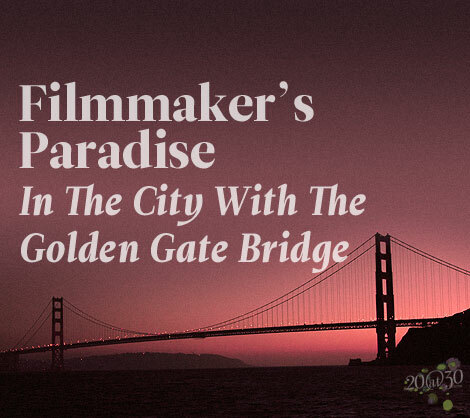 Tune back later this week for Part 2 of Filmmaker's Paradise in The City With The Golden Gate Bridge. Looks like that was a pretty cool tour. This is too funny though, The post I have going live today is about crossing the Golden Gate. Seems like we were both inspired. Yes. The SF Movie Tour was a great way to be creatively orientated around the city. I suppose great minds think alike!